Concisely, a summary of all I know. John Irving, The World According to Garp (1978). /Ground - A project I'm involved with that keeps tabs on localism as a global movement. Several upcoming conference presentations- Sustainable Food 2.0 at SXSWi, Evolution of Online Communities at NTC, Social Networking for Sharing Knowledge, Taking Action, for Fundraising at We Are Media. If you made it to this blog it'll be abundantly clear that the way to my heart is indeed my stomach. Looking forward to meeting you...if you want to talk nonprofit tech email me, or catch me on Twitter. Resources for learning about slow. Finally, my very own dot com implosion. More on why I'm putting this in the dot com implosion pile. I think this is still a big ripple of the 1.0 bust. We'll see some more museums and cultural institutions fall in the next few years. 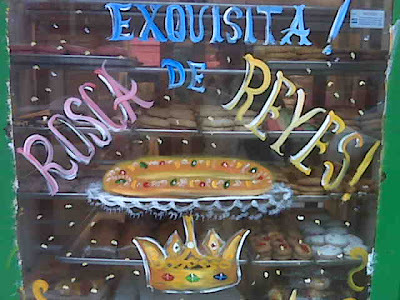 Last night on a whim a bought a Rosca de Reyes from Bakery la Mejor. No sign of baby Jesus yet. I'll update as tiny-things-baked-into-this-sweet-yeast-bread-ring developments emerge.